While the single-threaded languages simplify writing code because you don’t have to worry about the concurrency issues, this also means you can’t perform long operations such as network access without blocking the main thread. Imagine requesting some data from an API. Depending upon the situation the server might take some time to process the request while blocking the main thread making the web page unresponsive. Tip: Using Bit you can turn any JS code into an API you can share, use and sync across projects and apps to build faster and reuse more code. Give it a try. The function code executes inside the function execution context, and the global code executes inside the global execution context. Each function has its own execution context. 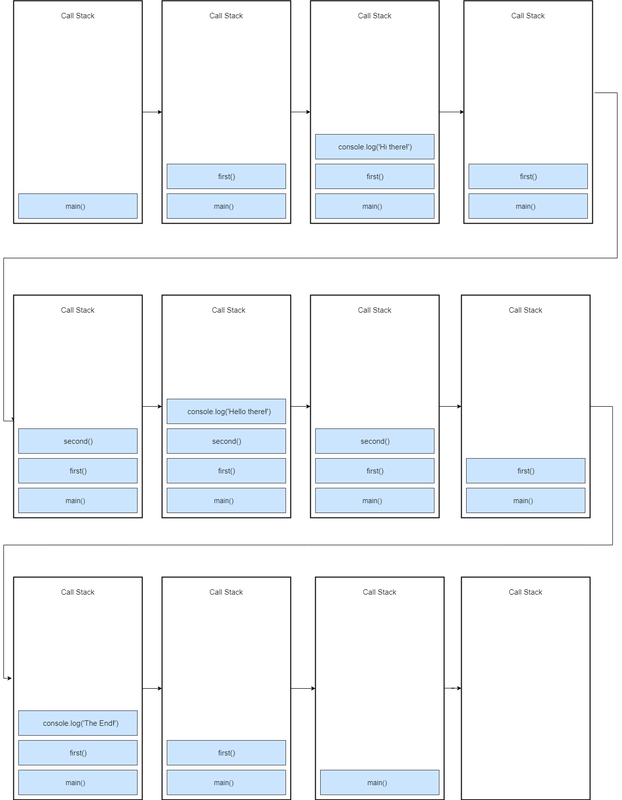 The call stack as its name implies is a stack with a LIFO (Last in, First out) structure, which is used to store all the execution context created during the code execution. When this code is executed, a global execution context is created (represented by main()) and pushed to the top of the call stack. When a call to first() is encountered, it’s pushed to the top of the stack. Next, console.log('Hi there!') is pushed to the top of the stack, when it finishes, it’s popped off from the stack. After it, we call second(), so the second() function is pushed to the top of the stack. console.log('Hello there!') is pushed to the top of the stack and popped off the stack when it finishes. The second() function finishes, so it’s popped off the stack. console.log(‘The End’) is pushed to the top of the stack and removed when it finishes. After it, the first() function completes, so it’s removed from the stack. The program completes its execution at this point, so the global execution context(main()) is popped off from the stack. Doing image processing and network request takes time. So when processImage() function is called, it’s going to take some time depending on the size of the image. When the processImage() function completes, it’s removed from the stack. After that the networkRequest() function is called and pushed to the stack. Again it’s also going to take some time to finish execution. At last when the networkRequest() function completes, greeting() function is called and since it contains only a console.log statement and console.log statements are generally fast, so the greeting() function is immediately executed and returned. So you see, we have to wait until the function (such as processImage() or networkRequest()) has finished. This means these functions are blocking the call stack or main thread. So we can’t perform any other operation while the above code is executing which is not ideal. To understand how this code is executed we have to understand a few more concepts such event loop and the callback queue (or the message queue). Now let’s get back to the above code and see how it’s executed in an asynchronous way. When the above code loads in the browser, the console.log(‘Hello World’) is pushed to the stack and popped off the stack after it’s finished. Next, a call to networkRequest() is encountered, so it’s pushed to the top of the stack. Next setTimeout() function is called, so it’s pushed to the top of the stack. The setTimeout() has two arguments: 1) callback and 2) time in microseconds (ms). The setTimeout() method starts a timer of 2s in the web APIs environment. At this point, the setTimeout() has finished and it’s popped off from the stack. After it, console.log('The End') is pushed to the stack, executed and removed from the stack after its completion. Meanwhile, the timer has expired, now the callback is pushed to the message queue. But the callback is not immediately executed, and that’s where the event loop kicks in. The job of the Event loop is to look into the call stack and determine if the call stack is empty or not. If the call stack is empty, it looks into the message queue to see if there’s any pending call back waiting to be executed. In this case, the message queue contains one callback, and the call stack is empty at this point. So the Event loop pushes the callback to the top of the stack. After that the console.log(‘Async Code’) is pushed to the top of the stack, executed and popped off from the stack. At this point, the callback has finished so it’s removed from the stack and the program finally finishes. 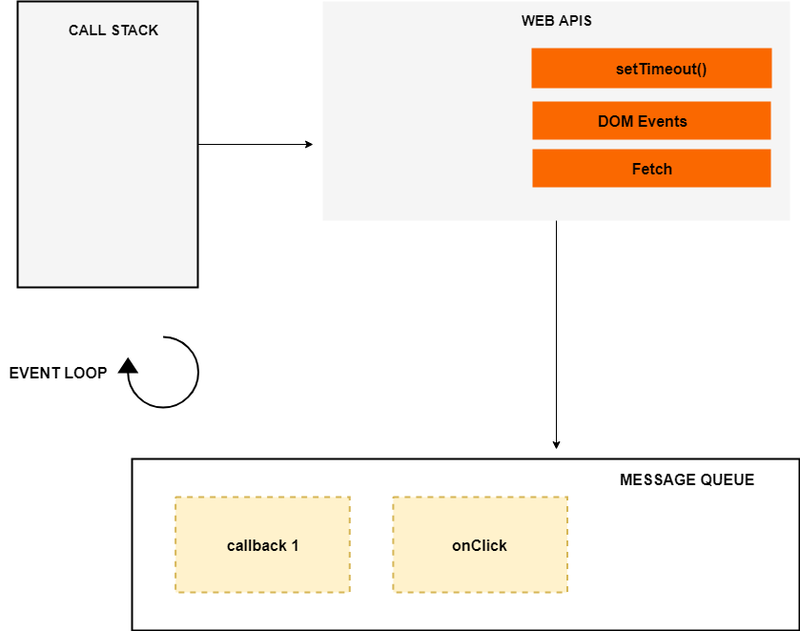 In case of DOM events, the event listener sits in the web APIs environment waiting for a certain event (click event in this case) to happen, and when that event happens, then the callback function is placed in the message queue waiting to be executed. Again the event loop checks if the call stack is empty and pushes the event callback to the stack if it’s empty and the callback is executed. When this code run, first foo() is called, inside foo we call console.log('foo'), after that setTimeout() is called with bar() as a callback and 0 seconds timer. Now if we have not used setTimeout, the bar() function would have immediately executed, but using setTimeout with 0 seconds timer helps to defer execution of bar until the stack is empty. After 0 seconds the bar() callback is put into the message queue waiting to be executed. But it will only be executed when the stack is completely empty that is after the baz and foo function has finished. We have learned how the asynchronous callbacks and DOM events are executed which uses the message queue to store all the callbacks waiting to be executed. We can see that the promise is executed before the setTimeout, because promise response are stored inside the job queue which has a higher priority than message queue.